Your friday facts today are written by the community manager Klonan. He's been with us here in the office for nearly 2 months now, working hard marketing the steam release and responding to all the media inquiries sent to our email. He's going to write a little about the behind the scenes of the steam release. You can also see from the reddit stats (many thanks for head moderator Zirr for providing them) that the steam release caused a big surge of interest in our game, with a lot of new unique users rushing in, and a rather large inflix of views, which has sustained over the last 3 weeks. It's also easy to see this when you check it out for yourself, where, compared to a few months ago, the level of activity and interaction is much higher. This traffic hasn't come as a big surprise to us, as we suspected that the steam release would cause a lot of attention pointed towards us. The sales numbers have been quite kind to us, and while we can't release specific numbers, we can make a short comparison. In the last 3 weeks selling the game on steam, we have sold more copies than in the lifetime of our website. This is an incredible number for us, and we owe it to our community to thank them for their support over the years. But it hasn't all been good news. 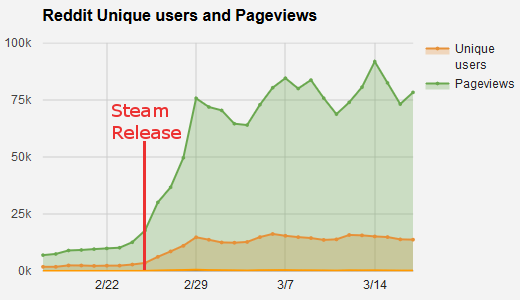 After the steam launch, the traffic of our main server increased a fair amount, as was expected. The first 'normal' Friday facts after the steam release demonstrated the 'Loader', and in typical form included with it a 25MB gif showing it off. Normally a gif so large would be no issue, but due to the increase in site traffic, along with hotlinking the gif to steam,it led to an overwhelming level of server strain. So now we have worked out how to address this. Moving forward we will post gifs to the website in the mp4 or webm format, and for the steam page we will host them on the steams artwork page in the community hub. Hopefull this will keep these sort of server troubles at bay for the most part. So just prior to the steam release, we deployed the functionality on the website, and while this went off witout a hitch, is has led to some other issues. Notably we have had a string of users have their accounts accessed by someone else and their steam keys stolen. This has caused a large amount of work for myself, and caused us to switch from showing the key on the page, to sending the key via email. We have also had some fraudulent purchases of accounts from our website, people purchasing the game using stolen credit cards, so as soon as its ready, we will deploy an extra protection measure to our website. This will come in the form of requiring a steam ID login to validate a steam key request. For average users this won't cause any issue, but for any nefarious account creations it shoud cause them a lot of hassle. Tangentially related to this, we are looking at ways of allowing steam users to sign up for website accounts and allow them to access the website DRM free builds. We had a lot of requests in for this feature, as a lot of people are looking to host servers, download for their other computers or just generally run the game without steam. This will take a while to implement, so for the meantime we have posted the headless server for free to download on the website. So as we all know, when you first go head to head with the train system in factorio, normally the train comes out on top. The whole process from placing rail, plopping down locomotives and setting your first stations can overwhelm many players. It gets even worse when the player starts to play with many trains, trying to understand the difficult task of signalling their rails for multiple trains. So this week a pair of guys by the name ColonelWill and Xeteth posted a great tutorial on youtube, which i think will immensely help any new players trying to learn the train system.